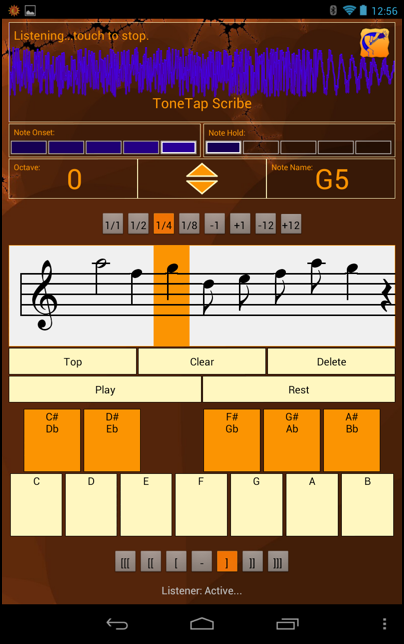 ToneTap Scribe is our latest music offering for Android. It’s a notepad for musicians. A place to quickly take down a musical melody, phrase, or idea in standard music notation. A tool for teachers, students, and anyone who uses the written language of music. Each short scrolling score, like the one shown here, can be instantly shared with another person, or another device as a standard MIDI file to be played back or edited some more in another score editing program. What makes ToneTap Scribe special is its ability to recognize the playing of most woodwinds and some other instruments, as well. With this feature, you can play your instrument and see the notes converted into concert pitch directly onto the score. In the example above, a user plays the note G5 on a flute. ToneTap Scribe displays both the audio waveform and information about the conversion, while placing the correct note in the score. This score can be edited with the musical keyboard, as well. It can be played back using a variety of instrument sounds. And the score file (standard .mid) can be shared instantly via Bluetooth, E-mail, SoundCloud, Google Drive, and others.